Other key findings of the analysis include the vulnerability of the UK’s energy infrastructure. 21% of all electricity is generated by 15 nuclear reactors, all of which are owned by EDF. This combination of monopoly of ownership and geographic clustering means that the civil nuclear sector is constantly on a high state of alert for a terrorist and cyber-attack. 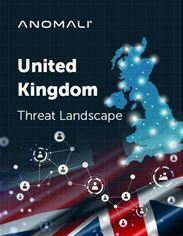 Commenting on the findings, Hugh Njemanze, CEO of Anomali said, “The UK presents a complex cyber risk picture – previous foreign policy commitments and current tensions between NATO and other nation states make it a target for international terror organisations. Within the UK, the nature of the economy and industry present a combination of opportunity and risk to those looking to plan a hybrid attack. The network of small and medium enterprises which support Critical National Infrastructure strengthens its resilience, whereas the geographical clustering of industries can weaken the system leaving them vulnerable to attack. In addition to this, the UK’s Financial Services sector, which is a key pillar of the economy is highly vulnerable to cyber-attacks – it is subject to regular and significant stress tests by the Bank of England to prevent a major disruption to the economy. The Anomali suite of threat intelligence solutions empowers organizations to detect, investigate and respond to active cybersecurity threats. The award-winning ThreatStream threat intelligence platform aggregates and optimizes millions of threat indicators, creating a “cyber no-fly list.” Anomali integrates with internal infrastructure to identify new attacks, or search forensically over the past year to discover existing breaches, and enables security teams to quickly understand and contain threats. Anomali also offers STAXX, a free tool to collect and share threat intelligence, and provides a free, out of the box intelligence feed, Anomali Limo. To learn more, visit www.anomali.com and follow us on Twitter: @anomali.